I made this photo in 1988 at the McNeil River State Game Sanctuary on the Alaska Peninsula 100 miles across Cook Inlet from Homer, Alaska. The grizzlies at both McNeil River and particularly at Mikfik Creek are the main attraction and your heart pounds anticipating being near them your first day there. But, the interaction between the seagulls and eagles is also interesting, and for me, somewhat disappointing maybe even a little embarrassing considering the symbolism of the majestic eagle in our USA. 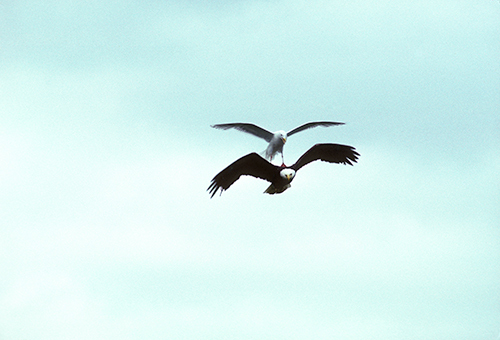 The seagulls would pester the eagles crazy. And this one had the courage to swoop down and hit the eagle on the back in mid flight. This image was made with a 35mm Canon F1n camera and 500mm Canon “L” lens on Kodachrome 64 film about 15 years or more years before Photoshop.